In medium bowl, toss strawberries and 1/2 cup sugar; let stand at room temperature at least 20 minutes. Meanwhile, in separate medium bowl, mix flour, 1 tablespoon sugar, the baking powder and salt. Stir in milk, butter, 1 teaspoon lime peel, the lime juice and eggs. Beat with hand beater until smooth. Lightly grease 6- to 8-inch skillet with butter. Heat over medium heat until bubbly. Pour batter by slightly less than 1/4 cupfuls into skillet. Immediately rotate skillet until thin layer of batter covers bottom. Cook until light golden brown. Run wide spatula around edge to loosen; turn and cook other side until light brown. Repeat with remaining batter, greasing skillet as needed. Stack wraps, placing waxed paper between each; cool completely. Meanwhile, in chilled small bowl, beat whipping cream with electric mixer on high speed until stiff; set aside. In medium bowl, beat cream cheese on high speed until fluffy; stir in 1/2 cup sugar and 1 tablespoon lime peel. Gently stir in whipped cream. Spoon about 2 tablespoons of the filling down center of each wrap; fold sides over filling. To serve, place 2 wraps on each of 6 plates. 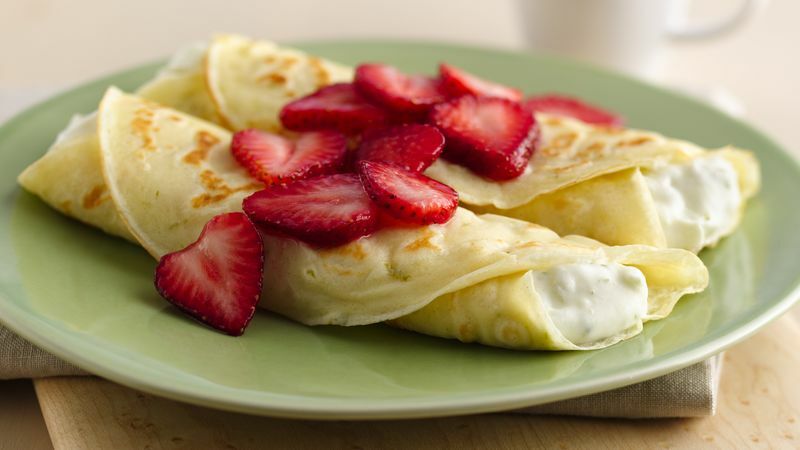 Spoon strawberries over wraps. Unfilled wraps can be tightly covered with foil and refrigerated up to 48 hours. Garnish with thin strips of lime peel and a dollop of whipped cream.